You run a soil model intercomparison? Get outreach HERE! Two examples: Infiltration, Root Architecture. The ISMC soil model intercomparison panel extends will establish an overview on currently ongoing intercomparison studies. This is facilitated through an online spread sheet. You, the community, are invited to report on current model intercomparisons. These can focus on processes, scales, mechanisms, input data.... Report on your comparison study here and leave your contact for gaining visibility, get ready for collaboration. Teamrat Ghezzehei, UC Merced, has been elected unanimously by the Executive Board to replace Michael Young, Uni Texas at Austin, as ISMC Co-Chair. Congratulations and good luck for the upcoming three years! The replacement will be effective from 1st of July 2019, and the official hand over ceremony will take place at the ISMC pre-AGU Meeting in December. Land surface models (LSM) show a large variety in describing and upscaling infiltration; Soil structural effects on infiltration in LSM are mostly neglected; New soil databases may help to parametrize infiltration processes in LSM. Under the keywords land surface models, infiltration, soil structure, upscaling, soil databases; an overview on twelve land surface model and representation of infiltration process is given, exploring concepts, theory and numerics behind the models. 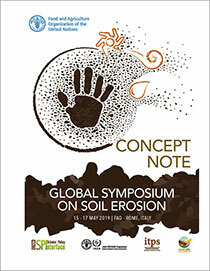 In 15-17 May 2019, the soil erosion community meets at the interface of science and policy in the FAO head quarter in Rome, Italy organized by GPS, ITPS, UNCCD Science Policy Interface, IAEA, and joint FAO IAEA programme. Consider joining the meeting and register your contribution with the organizers and web-site. The ESDAC provides a global assessment of soil erosion for 2012 and 2001. It is based on the Version 1.1 of the JRC/University of Basel "RUSLE-based Global Soil Erosion Modelling platform (GloSEM)". The original resolution is ca. 250m and the data package includes the soil erosion estimate in 2001, the input factors (K, LS, C, R) and ArcMap project files. The full doc­umentation of the datasets is provided in the published article and the additional material. Session, Workshop and Town Hall proposals are all now open. Deadline for submissions: 17 April 2019, 11:59 p.m. ET. We welcome proposals from AGU's entire community and especially encourage submissions that tie to AGU's Centennial or are collaborative sessions—particularly those related to climate change.